Candy - The Last Piece is a resin limited edition 100 artist doll by California doll artist Julia Rueger. This doll is # 4 of 100. 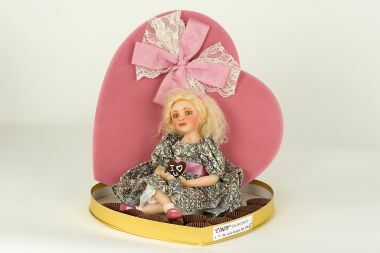 She sits in her own pink heart shaped Candy box, and holds the last piece of luscious chocolate, upon which is written the immortal sentiment "I Love You". Julia Rueger's doll making career started in the 1980s with the introduction of a successful series of clown dolls. 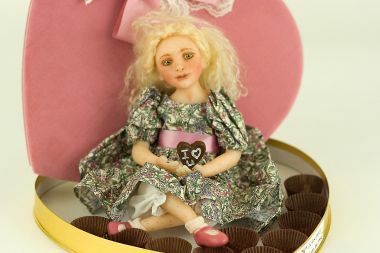 Fabrics and the doll outfits have always played an important role in her creations and have been carefully chosen by this artist to enhance the character in each doll she creates. Her dolls are childlike, and she has been careful to form her costuming conceptions around what real children wear, bringing color and "activity" to her pieces. She is also a refined sculptress who captures what she calls "the beauty of a child's soul" in the expressions she creates on her dolls faces. Together, the sculpted faces and costuming work in synergy to produce a most unique and attractive doll.